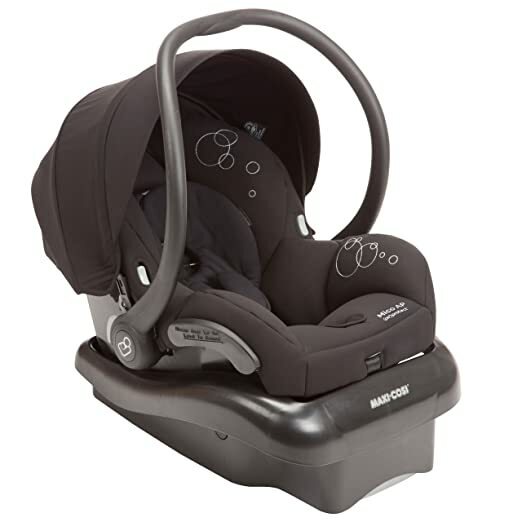 The Maxi-Cosi Mico AP Infant Car Seat is a great addition to every family car, if you have recently had a newborn baby and you want to keep him safe and sound while you are on the go. This outstanding baby car seat comes with a generous base that you can leave inside the car, and it also features a release handle located on the base that allows you to quickly and effortlessly detach the baby’s seat from the car. Once again, just like every other infant car seat, the Maxi-Cosi Mico AP Infant Car Seat comes with an advances two-piece buckle system that does not require you to overlap the two sides of the buckle, as it happened with the older models of the seat. This particular model features two separate buckles and this allows you to easily do each side separately, thus being a lot easier and considerably more secure for the little one. In addition to this, the base of the baby car seat can be attached with the help of the seat belt or the advanced LATCH system, and the base also comes with a great height adjustment feature – this way, you can always make sure that the car seat is correctly angled whenever installed. Overall, this infant car seat weighs less than 9 pounds without the base, which certainly makes it one of the most lightweight products in its class. The Maxi-Cosi Mico AP Infant Car Seat does have some downsides that every buyer should keep in mind before making the move to buy this chair, and many parents have complained about the flap that goes behind the buckle that looks like a pair of unnecessary wings. On the other hand, others have claimed that the strap used to cinch up the shoulder straps does not slide as smoothly and as freely as it should. Keeping all these advantages and disadvantages in mind, it is safe to say that this infant car seat sold by Maxi-Cosi is a great choice for those who are looking for an extra safe, extra padded, comfortable and very lightweight seat. The fact that it is so light actually makes this baby car seat so appreciated these days, as you do not have to worry about carrying too much weight even with the baby in it. Durable, sturdy and great for the baby, the Maxi-Cosi Mico Infant Car Seat is guaranteed to keep your child safe and sound during the car ride!